This is a big update with many new features, bug fixes and minor improvements. In addition, various parts of the GUI have been brushed up. Sequencer: Scale various line widths with fontsize. Sequencer: Improve painting sequencer grid. Sequencer: Adjust seqblock header colors. Sequencer: Improve painting the dragger. 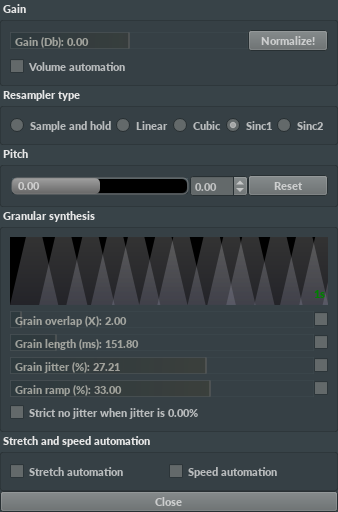 Sequencer: Tweak painting buttons and checkboxes. 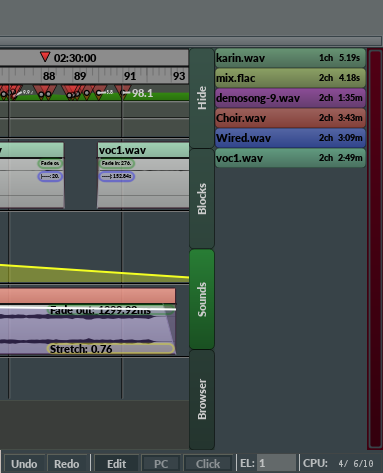 in the sequencer and select "Use sequencer timing". generated by the first seqtrack. lines" in the "T" button tooltip. GUI: Paint thin black border around buttons. and the mixer with a slight gradient color. Preferences: Add tab bar height option to the "GUI"
GUI: Some fixes for drawing text. integer. Earlier it was always rounded down. radium scrollbars in the sample browser. plugins should not be trusted. audio seqblock GUI when changing parameters. soundfiles with more than 2 channels. no 2ch "system out" module in song. situations when there's lots of grains in granulation. Build: Compile with -flto in release mode. gui_textWidth: add optional argument "guinum". Some bug fixes, especially on Windows. 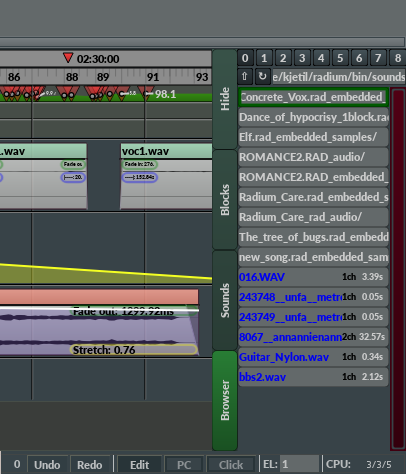 seqblocks when changing tempos of a editor block. other windows right after startup. only have been a problem in debug mode. 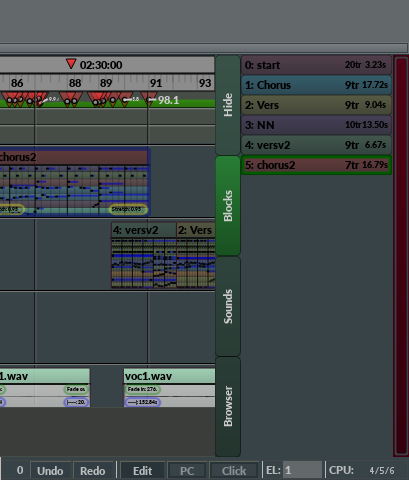 editing tempos, signatures, and markers. moving a vertical scrollbar in the right side tabs. releasing mouse button outside current widget. network disks in the file bropwser. only seen it happen in debug mode on Windows though. 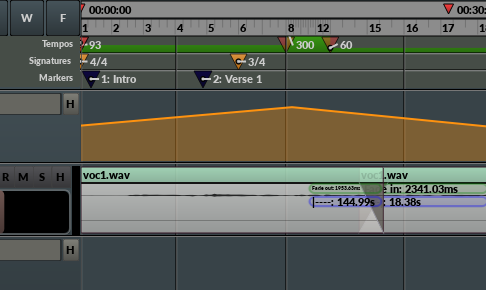 jumping to 0 when edited in the piano roll. Probably rare though. Bug introduced in 5.9.21. Emergency release to fix rare, but possible, undefined behavior in sequencer timing and automation. Bug introduced in 5.9.30. The release also contains a number of other bug fixes and minor features, plus some improvements to the manual. Mixer: Some minor improvements to the popup menu. the effect slider/checkbox popup menu. Control: Fix possible crash during shutdown. number of lines, changing tempo, etc. while playing. up in rare circumstanses in conjunction with timing. Help: Improve the documentation for timing. that entry was always painted in the hovered color. LZ is not 1. I.e. when LZ is 2, insert 1/2 line. If LZ is 1/2, insert 2 lines, and so forth. removing lines when LZ is not 1.
soundfont or directory couldn't be opened. performance as well by causing fewer cache hits. mouse is above an effect slider or checkbox. GUI: Adjust default background color a little bit. (Made it a little bit darker). for 'setInstrumentLoopData' from int to int64_t.